Arbonne’s Swiss, botanically based skin care is known for remarkable results in record time. Their tag line is “Pure, Safe, and Beneficial” – and it is this promise that they give to all of their customers, hostesses, and Consultants. The Arbonne story began in 1975 when one man, Petter Mørck, together with a group of leading bio-chemists, biologists and herbalists, fulfilled his vision and founded Arbonne. Arbonne’s skin care products, based on botanical principles, became a reality in the United States in 1980 and are now shared throughout the world through Arbonne’s network of Independent Consultants. Building on these same founding principles, Arbonne’s product line has since grown to include both inner and outer health and beauty products that are unparalleled in quality, safety, value, benefits and results! When I was 18 years old, I was invited to an “Arbonne party” at a friends house. I was a young military wife and mom in a brand new town and did not know many people, but I had one friend, and she invited me to a party – so no matter what kind of party it was (I did not have the foggiest idea what “Arbonne” was), I was going. Never in a million years did I think as I sat on the floor with my infant daughter, that my life would be forever changed sitting in that living room, listening to a woman tell me how I could be my own boss, make my own hours, and stay home with my baby girl. You have probably figured out by now that Arbonne was my first direct sales company, and even to this day still holds a very dear place in my heart. It was with Arbonne that I discovered a love for direct sales, home parties, recruiting, and leadership and even now years later, I am delighted to share their products, their mission, and their opportunity in this year’s Gift Guide. 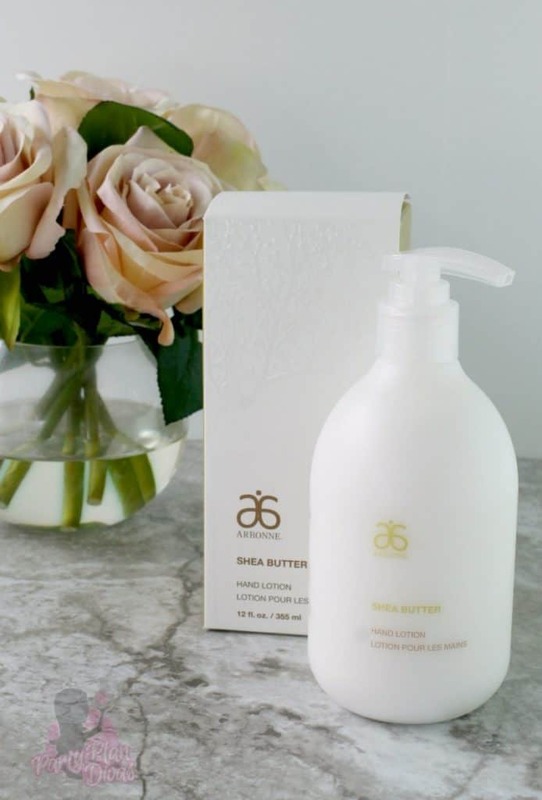 Formulated with sustainable shea butter that is harvested with fair trade principles and infused with geranium extract and sunflower seed oil, Arbonne Shea Butter Hand Lotion has a light, clean scent that deeply conditions your skin. Arbonne personal care products are formulated without animal products or animal by-products, Parabens, Formaldehyde-donating preservatives, or petroleum-based ingredients such as Benzene, Mineral Oil, Petrolatum, Phthalates, and Toluene. From skin care to hair care, baby care and even nutrition, Arbonne offers products that are “Pure, Safe, and Beneficial” for the whole family. To check out everything that Arbonne has to offer – including amazing products and a fantastic business opportunity – check out Dana’s website, and enter to win a $25 Shopping Spree below. I am excited to offer one lucky reader a $25 Arbonne Shopping Spree from Independent Arbonne Consultant Dana Sharp so you can choose which one of their amazing products you want to try for yourself! You can enter using the RaffleCopter widget below! Good luck! PartyPlanDivas is a participant in the Amazon Services LLC Associates Program, an affiliate advertising program designed to provide a means for us to earn fees by linking to Amazon.com and affiliated sites.